Water has many uses in our everyday lives. It is a thirst-quenching drink, it can help clean a wide range of things and is a universal solvent. Recently though, many of you may have heard of water being used as a source of energy. The Water Powered Calculator is a successful attempt to use water as a source of energy. 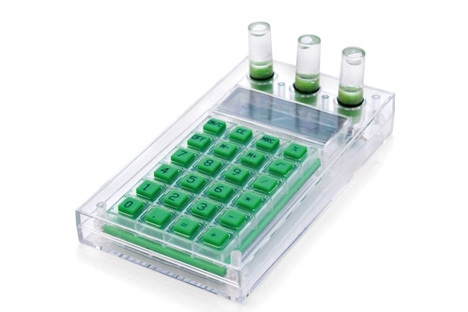 The calculator has three water batteries which look like the image shown below. The batteries consist two electrodes made of a special alloy which facilitates a chemical reaction in the presence of water, producing electricity to run the calculator. The battery timing is very impressive considering the fuel is water. The batteries last 2-3 months, during which time the water evaporates and can simply be replaced by simple, everyday tap-water. The concept of free energy is beautifully exemplified by the Water Powered Calculator. The transparent body allows you to see what goes on inside the device giving you a first-hand glimpse of the process as it is happening. It is a must-have for every mathematician, scientist and engineer.